The rent at 7250 W 157th St Apartments ranges from $1,825 for a two bedroom to a $1,875 two bedroom. Apartments in this building are about 13% less expensive than the Orland Park average. This apartment is in Orland Park. Nearby parks include Veterans Park, Veterans Park and Filson Park. 7250 W 157th St Apartments has a Walk Score of 49 out of 100. This location is a Car-Dependent neighborhood so most errands require a car. Newer Construction, spacious, sunny, 2 bedrooms, 2 baths, condo like apartment with hardwood floors, large kitchen with plenty of cabinets, granite counter top, stainless steel appliances, dishwasher, whirlpool tub, dining area/kitchen nook, outside deck, walk-in closets, laundry inside the unit, gas forced air & central air conditioning, garage, & assigned outside parking space, secured bldg with intercom system, & private storage locker. Great trendy Orland Park area near Cooper's Hawk Winery, and plenty of well known stores and restaurants. There is emergency maintenance available. This property is located off Harlem just north of 159th street. Please call Judy for more information or to schedule a viewing. There is a $35.00 charge for a credit check. There is one unit available for July or Aug. Rent is $1825.00. Explore how far you can travel by car, bus, bike and foot from 7250 W 157th St Apartments. View all Orland Park apartments on a map. Search for homes in Orland Park or find a Orland Park real estate agent who knows walkable neighborhoods. Links will open on our partner site Redfin.com. 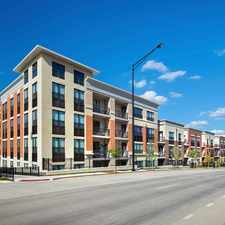 7250 W 157th St Apartments is in the city of Orland Park, IL. Orland Park has an average Walk Score of 28 and has 56,767 residents.